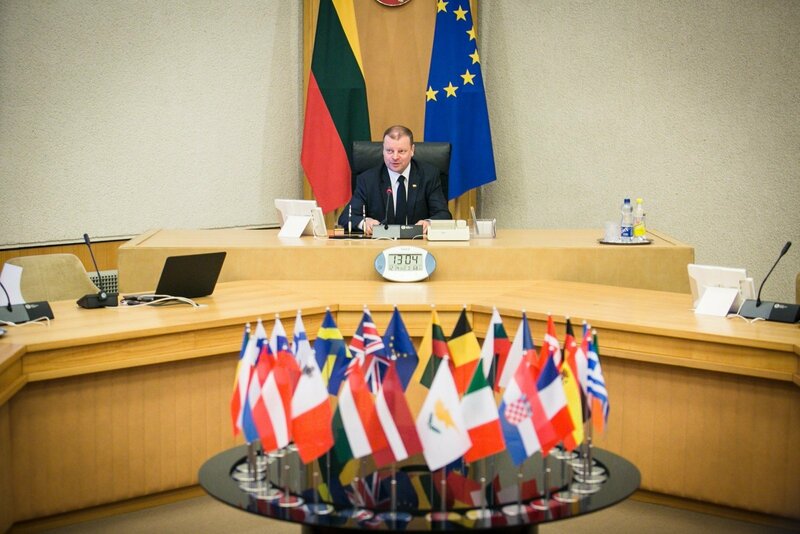 Lithuania's Prime Minister Saulius Skvernelis on Thursday briefed ambassadors of European Union (EU) member-states residing in Vilnius on the foreign policy course of the new 17 th government, accentuating that consistency, activeness and continuity would be key in the area. "NATO has always been the most important and the most efficient system of collective defence, which ensures state security, it will always be that way, therefore, we will seek that the decisions taken in Warsaw are fully implemented. We will continue ensuring NATO commitments, the 2017 budget will envisage 1.8 percent of the gross domestic product for defense," the head of the government said at the meeting, which was initiated by Slovakia as the EU's outgoing presidency holder. In his words, a strong, constructive and efficient EU is also a key interest of Lithuania, as well as the key factor for political, economic and social development. Skvernelis also said that Lithuania would work consistently to boost the unity of the Baltic states and their cooperation, stepping up political and economic ties between the Baltic and the Nordic countries, as well as seek an open bilateral dialogue and cooperation with Poland on existing issues. In his words, the key objective in the policies towards Russia is encouraging the Lithuanian neighbour to stop using force, military aggression and other unlawful actions on the international arena.